I have requested a kitchen blow torch from my hubby and kids for a good three years for my birthday and Christmas. I adore crème brûlée and always order it if a restaurant offers it while I'm out for dinner. It is seriously my absolute favorite dessert on the planet. 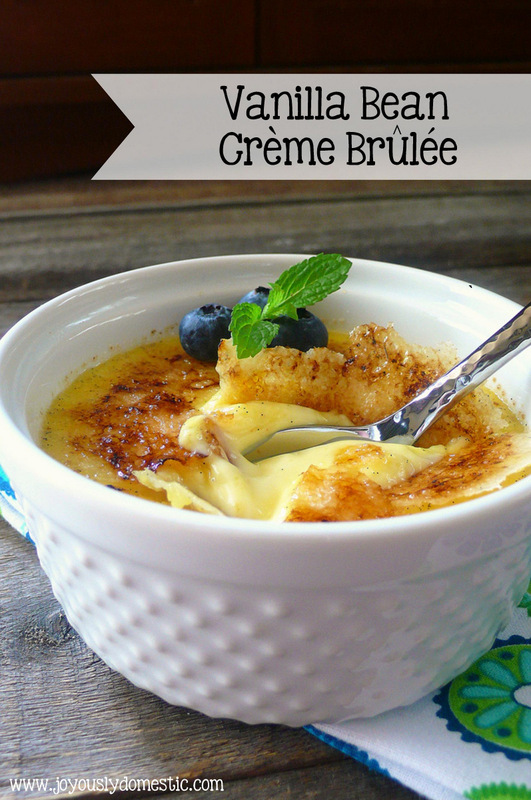 Crème brûlée, also, happens to be one of my kids' favorite desserts. We usually just order one and share it while we're out to eat, so you can easily conclude that I only get two or three bites. (The moms out there know what I'm talking about.) We were all looking forward to making this dessert at home so that we could each have our own! This recipe yields six individual servings. The hardest part of the recipe is waiting for the custard to completely chill before topping it with sugar, torching the heck of it and cracking it open with a spoon. Preheat oven to 325 degrees. Have six ramekins ready on a large, rimmed baking sheet. Cut the vanilla bean in half (if using) and scrape out the "caviar." Combine the vanilla bean caviar (or extract) with the heavy cream in a medium sauce pan set over medium heat. Heat just to a simmer, but do not boil. Very slowly, incorporate by drizzling about 1 cup of the hot cream mixture into the egg yolk mixture while whisking vigorously. Once egg mixture is tempered, continue to add in the remaining cream mixture slowly and whisk until all is well-combined. Strain custard mixture through a fine mesh strainer into another bowl if desired. Ladle the mixture equally into ramekins. Transfer baking sheet of ramekins to oven. Pour in enough boiling water to come about halfway up the sides of the ramekins. Bake for 30 - 35 minutes or until custard is set around the edges, but still just slightly soft and jiggly in the center. It is important that the custard does not brown. When ready to serve, sprinkle on a thin layer of sugar and caramelize using a blow torch. The sugar will become bubbly and will crackle with a spoon once cooled. Serve immediately. Perfect with fresh berries. Heck yes! So glad you got that blowtorch and can finally have your own serving :) It is sooooo good, and even better homemade, for some reason! Joyously Domestic Is Now on Instagram!